Across the street from the Millenia Mall between Olive Garden and the Container Store. 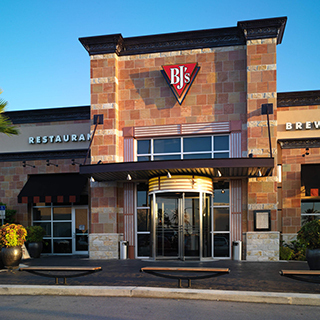 BJ's Restaurant & Brewhouse is proud to be part of the Mall at Millenia experience. Whether you live in Orlando or you're visiting, you'll love our fine selection of handcrafted beer and the delicious options on our menu. Our building is designed for a spacious, welcoming environment for get-togethers with friends. You can always expect outstanding service at BJ's, and you'll want to come back again and again to taste each drink and appetizer. Whether you love the rich mix of flavors in a deep-dish pizza or you want a taste of more innovative confections, there's something for you on the BJ's menu. There are also a variety of gluten-free and vegetarian options to choose from, including a pizza with a gluten-free crust. Between a selection of baby back ribs and steaks, sandwiches and salads, there are no wrong choices. You can also place an order online and come pick up your favorite BJ's dish to go. Like all good brewhouses that take the craft seriously, we know that the brewing process is both an art and a science. BJ's Restaurant & Brewhouse selects unique flavors from all over the world for our beers. Our BJ's Camaraderie Ale is brewed in Belgium, and our Tatonka Stout is an imperial stout with Russian roots. Also available on tap are our seasonal beers, which we choose to fit the time of year with unique spices and flavors. If you don't want beer, we also have a variety of wines and mixed drinks to order. After exploring modern fashion and shopping at the Millenia Mall, settle down for the rustic taste of handcrafted beer and delicious food at BJ's Restaurant and Brewery. We look forward to your visit! Best happy hour in Millenia! Half priced apps and great discounts on cocktails and beers. Balanced with eager to please and highly energetic smiling team members!